When I first started cardmaking, I underestimated the importance of cardstock. I quickly learned that not all cardstock is created equal. After a few months, I settled on PTI cardstock which is thick, heavy, and comes in a slew of colors. After another couple of months, I decided to see what else was out there (never a good thing to rely to heavily on one company). I'm not a matchy-matchy color person (don't need the matching button, ribbon, and ink), so my only criteria was 100+ weight, smooth finish, pleasing colors, and reasonable price. I ordered from a few companies and I found that I really, really like Mark's Finest Papers! I purchased a bunch of colors and here's the color comparisons to PTI bundled according to color group. Both of the papers are virtually indistinguishable in weight and feel. The fresh cream (MFP) is more of a traditional cream compared to PTI vintage cream. PTI has a more greige undertone to it. 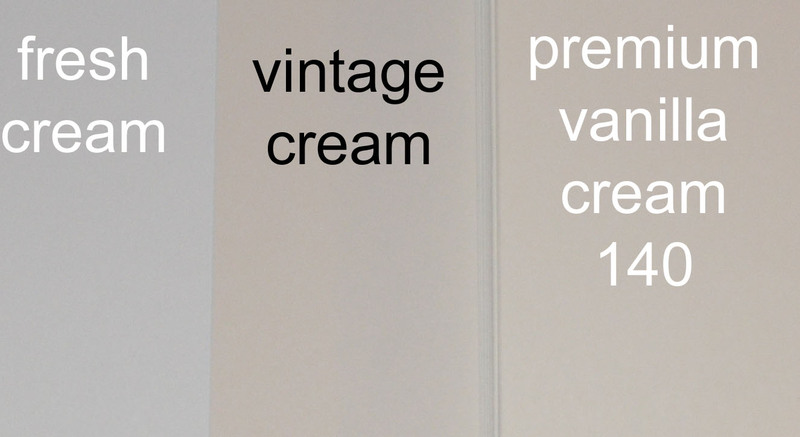 The MFP premium vanilla cream is very close to PTI vintage cream (slightly more creamy, less greige). I don't have a picture but MFP barely pink is a great alternative to PTI vintage cream. MFP barely pink reads cream and looks like a warm version of PTI vintage cream. I actually prefer the MFP barely pink as a cream because of the more obvious warm cream color. The blacks are comparable, but if I had to choose PTI because it's a deeper black. I'm showing MFP evergreen because it reads a very, very dark twilight color in person. You could use it for a night sky, deep forest, deep ocean choice. PTI hawaiian shores is an almost perfect match to MFP aqua light. MFP sea breeze is a slightly bluer version of aqua mist. I prefer the bluer version, because aqua mist reads minty green sometimes for me. MFP mossy sage is like PTI ocean tides in that it changes color depending on what is next to it. MFP mossy sage is a great grey. Personally, I never could match PTI ocean tide to much. Of the lime greens, I prefer PTI simply chartreuse. MFP limeade is more of a candy/neon lime. Comparing the mid-greens, I prefer MFP lily pad to PTI new leaf. MFP lily pad has a softer, more natural leaf green. I always found PTI new leaf to be too bright, too distracting, and in need of a touch of yellow. In the olive green department, MFP deep olive has a slightly deeper, more brown undertone. PTI ripe avocado is more olive-y and yellowy. Of the two, I don't have a clear preference. There are hardly any real matches in this category. Most of the colors are pretty different and your preferences would depend on the application. MFP orangerie sunset is 1 -2 shades lighter shade than PTI terracotta tile but with the same type of color. MFP garnet and PTI scarlet jewel are almost a perfect match. MFP garnet is ever so slightly darker/browner (almost imperceptible). Of the reds, PTI pure poppy is the definite winner (there is a MFP red I did not order called cherry slush). PTI pure poppy is more of a true red. MFP razmataz berry and PTI raspberry fizz are pretty perfectly matched. Of the light pinks, I prefer MFP markie's strawberry milk because (as you can see) PTI sweet blush often reads peachy. There are no real matches in this category and my preferences are split. I prefer PTI plum pudding and MFP grandma's lavender patch. PTI lavender moon reads very pinky to me and I could never match it with PTI plum pudding. MFP grandma's lavender patch is more real lavender and looks great with PTI plum pudding. MFP chipboard is their version of kraft (don't have PTI kraft to show). In person, MFP barely pink reads more of a warm cream than pink. Of the chocolate browns, I actually wish there was an in between brown (MFP does have other browns I did not purchase but they have "flecks"). The MFP dark chocolate bar is too dark (less warm) and the PTI dark chocolate is too light and too crimson-y to me at times. So in summary, there's no real winner, but rest assured that there are alternatives out there! 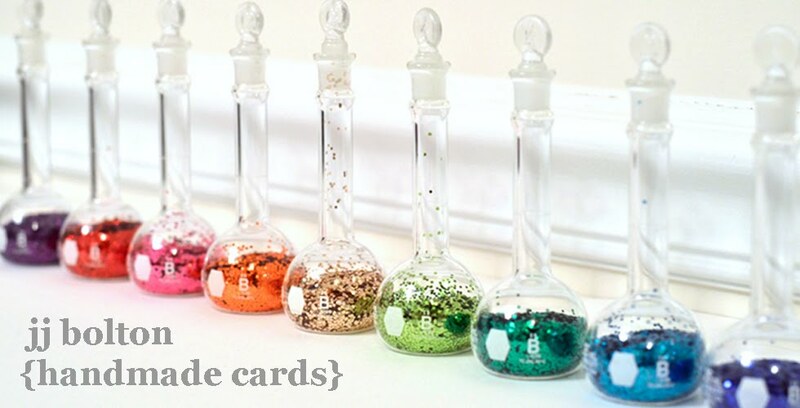 Hope this helps you fill the gaps in your cardstock collections! Thanks for visiting! love this comparison. thanks so much! I think this is such a great post you offered us. Thanks so much for all that work JJ.